It was only April, but consumers had summer fun on their minds as sales of personal watercraft, jetboats and ski boats roared upward by margins of 22 to 44 percent. Sizable gains in all three categories helped propel sales industrywide to 14,475 boats, a gain of 17.5 percent from the same month last year, according to figures compiled by Aarn Rosen, national sales manager at Statistical Surveys. Sales of PWC rose 21.8 percent to 2,501; sales of ski boats rose 28.2 percent to 409; and sales of jetboats surged 44.3 percent to 329. “April sales in these categories reflect consumers who are feeling more confident and willing to spend, regardless of price point,” Rosen says. Sales in these segments also have shown double-digit growth for the year. Jetboat sales are up 25 percent through April to 760. Industrywide, sales for the first four months of the year are up 15.8 percent to 34,880. Another category that showed dramatic growth in April was aluminum pontoon boats. Pontoon sales climbed 37.7 percent for the month to 2,329 boats. Through April, sales in the category are up 29 percent at 4,470 boats. 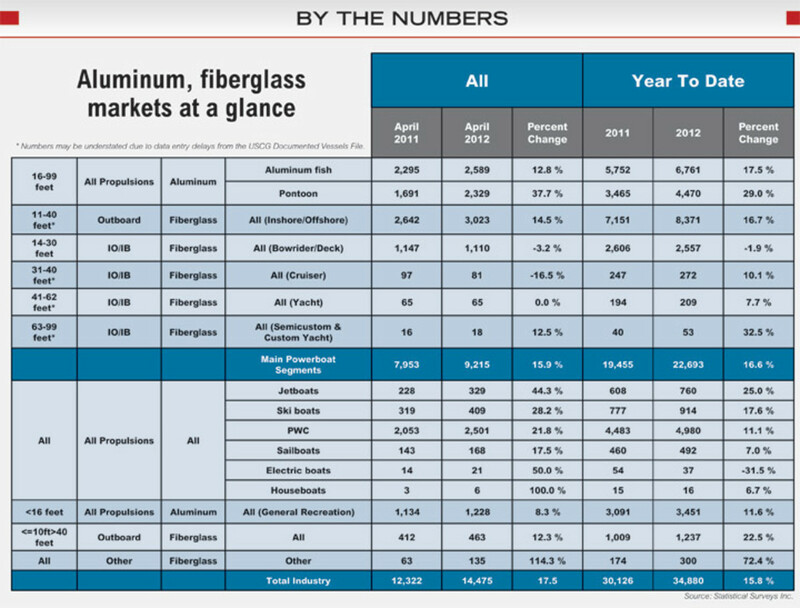 Aluminum boats have helped lead the industry’s recovery for more than a year. Sales of aluminum fishing boats rose 12.8 percent in April, to 2,589, and gains in the aluminum categories were a major factor as sales in the industry’s main powerboat segments rose 15.9 percent for the month to 9,215 boats. Through April, main-segment sales are up 16.6 percent at 22,693. “Pontoons are leading the recovery because of product innovation, a plethora of price points and possibly consumer preference for a multipurpose boating experience,” Rosen says. The sales data for April were based on information from 28 early reporting states that represent about 59 percent of the U.S. boat market. April sales represent 12 to 13 percent of the year’s retail activity. Reports of sales of documented vessels were complete only through April 10 because of data entry delays at the Coast Guard, Rosen says, which means sales totals for boats 30 feet and larger were significantly understated in the data. Sales of 31- to 40-foot cruisers were listed at 81, down by 16 boats, or 16.5 percent, from April 2011, and sales of 41- to 62-foot yachts were flat at 65 boats. There were 18 reported sales of 63- to 99-foot semicustom and custom yachts, two more than in April 2011. “Cruisers appear to be lagging the market, but as the Coast Guard continues to catch up, even the cruisers and big boats appear to be gaining ground,” Rosen says. The cruiser segment and the two yacht categories are solidly higher for the year to date. Two of them have shown double-digit gains. Sailboat sales rose 17.5 percent in April to 168 boats. They are up 7 percent, to 492 boats, for the year.